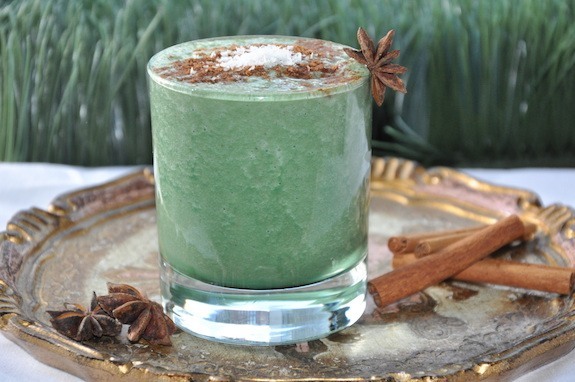 Leave it to us to sneak a smoothie into your holiday and under the mistletoe with this festive Egg Nog Green Smoothie. It’s made with avocado, vanilla, and date for a creamy richness, so the typical holiday beverage has nothing on it (okay, except for the bourbon). New York-based Arielle Haspel, the nutrition expert for Flybarre, the athletic barre class created by Flywheel, regularly features healthier versions of favorite decadent foods on her site Be Well with Arielle, like “healthy brownies” without any sugar or milk—and this better-for-you green spin on egg nog. “Egg nog is one of my favorite holiday treats, but it’s traditionally made with loads of sugar, heavy cream, and even, raw eggs. This version is healthy enough to drink for breakfast on-the-go [and] sweet enough to count as a holiday dessert,” says Haspel. Blend all ingredients, and serve in a pretty glass. Cheers!